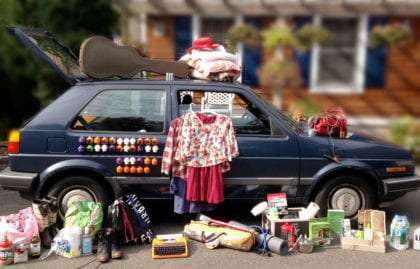 Our latest blogger, Amanda Bloom, throws us into her world; exploring how she became a townie, why she decided to leave, and the contents of the 1988 VW Golf she calls her traveling companion. Introducing Amanda Bloom, our latest travel blogger. Amanda is a female solo traveler touring the United States out of her 1988 Volkswagen Golf. I never thought I would be a townie. As a young girl, I didn’t have a clear picture of where I would choose to live, but I imagined it wouldn’t be my hometown of Newtown, Connecticut. I was sure I was going places; in my mind I saw cities, forests, places where no hills hid the horizon. Save for a college semester in Australia, I ended up staying close to home. I attended a state university in the small city of Danbury, 20 minutes away from Newtown. The city’s nascent arts and music scene wooed me, and I moved there two years later. By the time the scene petered out, I had a nice, affordable apartment, a boyfriend in the next town over, and the nearby company of many of my high school friends. Life may not have been full-tilt exhilaration, but it was comfortable and familiar. When you’re a townie, it’s not uncommon to date within your age-old circle of friends. You spend years growing and changing alongside someone, and suddenly you see them in a different light. Platonic affection folds into something tender and nuanced. You wonder if this person is what life has in store for you, if your shared history has been a slow-growing foundation for a meaningful relationship. You wonder if your hometown is your true home, and if you are meant to make a life there with this person. Like water, you settle into your container; like all of us, you build your life with the resources available. That is what happened to me this past winter, just after I broke up with the boyfriend in the next town over. In a turn of events straight out of a teenage television series, my good friend left her boyfriend of ten years for his best friend, someone I had been involved with in my early twenties. Her ex waited all but two minutes before pursuing me with fists full of poetry and prose, and though I tried to keep my head down and tend to my own romantic wounds, I couldn’t help but consider the new order of things and my place within it. I forewent my friend’s wishes and dated her ex, but my small-town storybook romance was not as fated as the one she has with her old-friend-turned-new-lover. Hurt and angry by my lack of deference, she disregarded the context of it all and presented me with a seemingly permanent and bitterly cold shoulder. I’ve grieved, guilted, and fumed over losing her, but even more painful has been losing my place in our close-knit group of friends. Being at odds with her has served as the soil knife pulling me up and out of the ground, roots dangling all the way to the weed pile. By springtime, I was single again, socially outcast, and deeply depressed. On July 5, I called my mom and my stepdad, and then my dad and his girlfriend, to tell them of my plans. I persuaded them that my trip was not one of escape, and they offered to help however they could. Some seven weeks later, my writing career and I took to the road in Dusty “Scarface” Bloom, my midnight blue 1988 Volkswagen Golf. While I’m traveling alone in a physical sense, my family and friends have found their way under the hood, between the seats, and tetris-style into the trunk–there’s even tufts of my cat’s hair in the carpet and on the seats. I spent $1,000 on new parts for my car, including four tires, front struts and ball joints, a front left axle, a battery, and a whole new exhaust system. My dad, a Gold Meister technician for Porsche and Dusty’s veritable pacemaker, installed everything pro bono. Four new speakers, a Bluetooth-capable head unit, and a subwoofer have made Dusty’s crackling sound system into a blissfully loud bass factory, thanks to my stepdad’s wiring and jerry-rigging knowhow. He and my mom have also supplied me with my U.S. Army-bound younger brother’s leftover stack of MREs, an industrial-size jar of Jif, a homemade first aid kit, a pocket knife, and a Tag-Along cooler I remember from trips we took to the beach 20 years ago. My older brother added me to his AAA Plus membership, giving me access to free fuel and delivery service, tows of up to 100 miles, and all sorts of other benefits, from up to $2,600 in reimbursement for legal fees accrued from motor vehicle violations to extensive discounts at hotels, restaurants, and even dry cleaners. Twenty-three Chx von Bs and 10 Mr. Boneses, magnetized characters from the Chx World interactive street art project by Danbury-based sculptor Jim Felice, are wrapped carefully in paper towels inside a plastic lettuce container in my trunk. Chx, who is reminiscent of the Lego Guy, Mr. Bones, a small skull, and Ricardo, a cast cement face with an eternal smile, have already traveled as far as Russia, Spain, and South Africa, and Jim has asked me to also serve as Johnny AppleChx as I travel. Other friends have equipped me with a solar-powered phone charger and shower, a windshield-mounted compass, an atlas, a tent, a typewriter, homemade chapstick, a headlamp, chocolate, a tire gauge, fuel injector cleaner, a gift certificate for an L.A. ice cream truck, hours of music, and heaps of recommendations on things to see and do, people to meet, and places to stay. So this isn’t really a solo road trip at all. I’m leaving a lot behind, but I’m also taking a great deal with me. My car is brimming with clothes, blankets, food, and tools as much as it is with the presence and well wishes of people I am more than lucky to know. Thanks Joe! Hoping all is well is the world of Shalamazoo, teaching, and invention. You are” Wonder Woman of 2014″. How great to be so open and willing to soak up life … and did I mention Brave. Your blog is amazing , We will keep in touch! I’ll follow you to the end of the earth! Way to go!!! Enjoy it.